An accumulative storage system that allows up to four pallets deep to be stored per level. Pallets are placed on trolleys on sloped storage lanes and pushed back along the rails. The incline of the push-back racking structure means that pallets towards the back of the lane move forward when the pallet closest to the aisle is removed. 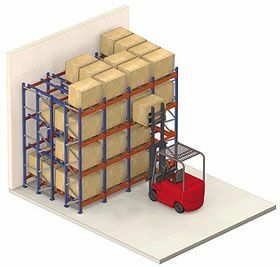 Push-back pallet racking is ideal for storing medium-turnover products, with two or more pallets per SKU (using the Last In First Out (LIFO) system).